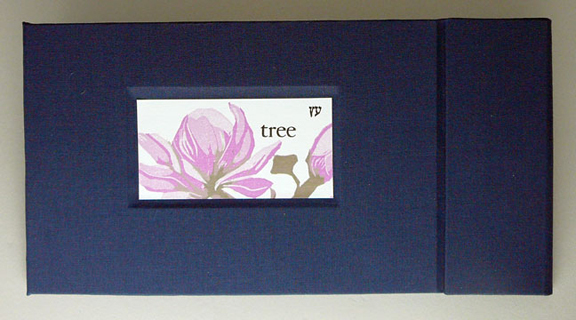 The hardcover book bound in midnight blue book cloth with a wraparound magnetic cover and inset cropped image. Each signature is created from a folded glassine page that opens to reveal a silhouetted, multiple-color linoleum print of a tree branch with a personal significance: Magnolia, Camphor, Silver Dollar Gum Eucalyptus, Hawthorn, Liquidambar, and Live Oak. Short creative nonfiction pieces are letterpress printed from handset type on the glassine. Colophon includes an abstract print made from the remnants of the final linoleum blocks. Front endpaper is wood veneer paper. 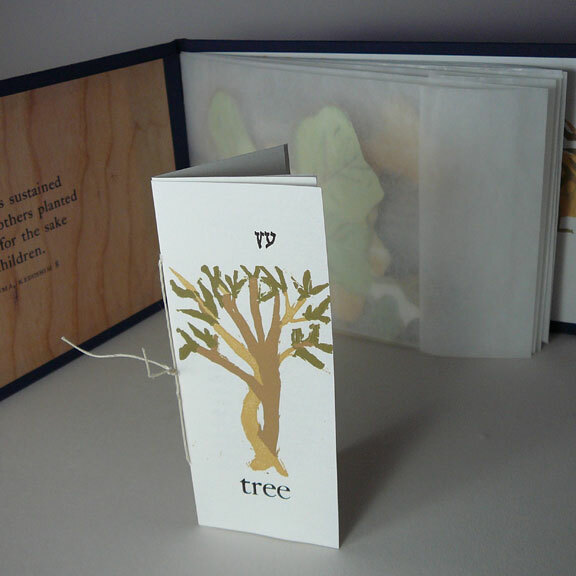 Also included is a narrow booklet with a fictional modern folktale and a seventh reduction print of a Russian Olive tree. Dedicated in memory of the tenth year of their absence: Ezra (1997-2003) and Dorothy Singer Simon (1911-2003). Size: 10 1/2" x 5 1/2", opens to 23 1/2" x 5 1/2"
© 2013 Alisa Golden. All rights reserved.